Lately I’ve been talking to a bunch of people looking at either creating a brand new SaaS product or moving their traditional on-premise application to the cloud. There’s always a discussion of the issues around connectivity and the price to be paid in usability by moving 100% to a web app. After all – even Google, the quintessential web app company, provides offline access for many of it’s applications. I’ve been using SaaS accounting applications for years now and I have to admit that lots of data entry really becomes a pain, even with a reasonably good internet connection, online apps will never be as fast as something on the desktop. When the operation in question incudes large amounts of data entry… well you get the idea. RapidFire is aimed at accountants and bookkeepers and is initially only available to accountants that use the company’s Orbit Accounts product for managing multiple clients. 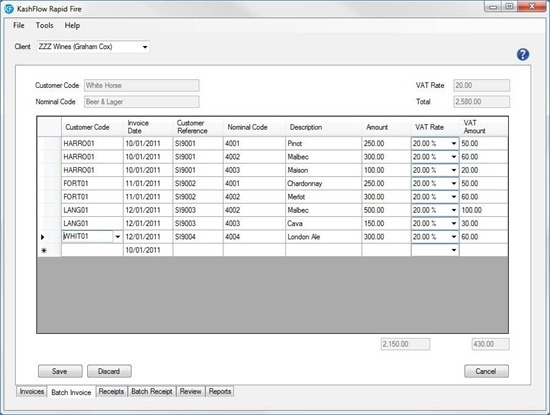 The accountant can set up multiple RapidFire Bookkeeper accounts and select which clients the bookkeeper can enter data into. Pricing on RapidFire is GBP13.99 per month and, as mentioned previously, is currently only available to practices. KashFlow CEO, Duane Jackson, told me that the intention is to offer it to end users after a period of iteration. As to the interest in the product, Jackson told me that one of KashFlow’s big bookkeeping franchise partners with hundreds of franchises originally requested the feature – therein lies an indication of the potential of offline functionality for SaaS applications. As I said previously – the reality is that for companies with lots of data entry, or located in patchy connectivity areas, a desktop offering like this can quite possibly be the difference between a product that is nice but simply not fit for purpose, and one which ticks all the box. KashFlow should be congratulated for not being blinded by the on-demand kool-aide and realizing that users want to work in familiar ways. The question now is whether KashFlow’s UK competitors follow suit – at press time none of those vendors replied to my questions – will update if/when that changes.